A majority of independent voters disapprove of how Barack Obama's handling his job as president, according to a new CNN/Opinion Research Corp. poll. WASHINGTON (CNN) - A majority of independent voters disapprove of how Barack Obama's handling his job as president, according to a new national poll. Fifty-three percent of independents questioned in a CNN/Opinion Research Corporation survey released Tuesday say they disapprove of how Obama's handling his duties in the White House, with 43 percent in approval. That result marks the first time in a CNN poll that a majority of independents give the president's performance a thumbs-down. Obama's overall approval rating of 53 percent is down 3 points from a month ago, and down 8 points from June. Forty-five percent of those questioned disapprove, up 5 points from a month ago and up 8 points from June. According to the poll, nine in 10 Democrats approve of the job Obama's doing, up three points from a month ago, with 15 percent of Republicans approving, down 8 points. "Obama won a majority of the vote among independents last year, and that helped put him in the White House," says CNN Polling Director Keating Holland. 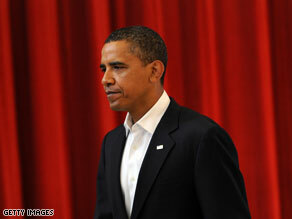 "Losing their support makes it more difficult for Obama to govern from the center." Broken down by issues, the president still gets majority support on foreign affairs and terrorism, but a majority now disapprove of how he has handled health care, taxes, the economy and the budget deficit. Is the fight over health care responsible for the downturn in Obama's numbers? "Yes, in part, but his standing on some other issues has taken an even bigger tumble," adds Holland. "Among all Americans, his rating on health care has dropped 13 points since March. Compare that to his 16 point drop on the deficit and 17 point dip on taxes and it looks like there is growing discontent with Obama's overall domestic agenda - not just his health care policy." According to the poll, Obama's approval rating on how he is handling the war in Afghanistan also fell 18 points since March. The survey also indicates that 37 percent of Americans think the media has treated Obama fairly, down 18 points from February. One in four say the media has been too critical of the president, up seven points from February and 36 percent say the media has not been critical enough, up 10 points. Who cares????? Guess what? He's still our President until 2012 and that's the only time a "poll" matters and that is called an election! If he's done such a bad job by that time he'll be voted out . . . until then shut up and let the man do the job we elected him to do! No journalism in America. These people publish what is in their best interest. I don't care about every second polls! There are people who talk about helping the poor and needy. They're called "Christians". There are people who actually help the poor and needy. They're called "Socialists". Doesn't government run Medicare work great for seniors? Doesn't government run SSI provided help for disabled people? Hasn't government run CHIP helped millions of uninsured children? Don't you rely on your government run SS check each month? When you reject government run care programs you reject all the above as well. Why wouldn't a universal health care program, run by the government work just as well? Because the Insurance companies don't want to stop ripping us off everytime we need medical care? Because the GOP want Obama to fail? These aren't good reasons people. Some of you people just don't make any sense – but you know what? The American people aren't so easily fooled these days – we see thru your "Great White Hope" ideology and reject it. "Thank you sir! May I have another?!" OK, ok so we're all in this predicament because a bunch of blind, easily led ignoramuses got in a few more votes than the sane-rational crowd. I have to say I wasn't happy with McCain as a choice but Palin seems infinitely more intelligent than Biden which isn't saying much. Choosing thebest or worst of two bozos wasn't easy because the thin line was blurred one way or the other for many valid reasons on one "side" or the other. We're all in this lot together now with some who still blindly "believe" and some trying to fix the mess in one way or the other. It's amazing and entertaining to read posts from the "we won" crowd who expect the rest of us to sit down and shut up. Talk about misguided loyalty. Camelot is dead, welcome to Spamalot. Change is coming folks but it isn't what you were misled to believe. No definition of "change" was ever offered so they're making it up as it suits them and we all get to eat it. You may as well sit back and shut up too. Nothing you're writing here has any bearing beyond pure entertainment. who needs a poll? Just ask anyone that works for a living, pays taxes, and generally supports themselves without the "Nanny," stepping in....OBama's the worst president ever...! What an achievement for less than a year! "can anyone say affirmative action OBAMA?" Good to see all the racists are alive and well on this site. It would be a different story if anything...anything at all...actually worked as promised. Eventually it becomes hard to defend without actual results. And no..getting legislation passed doesn't count as results. Democrats are the majority in the House and Senate and they apparently don't mind passing legislation with no minority support. Results would be more like if the legislation actually worked. Jobs, etc....things like that. Not happening. Gee Whiz – all these people disapproving of what President Obama is doing. He must be doing something right to cause such a reaction. Folks, let the guy do his job. Tell your Senator and Representative to govern from the center so that a fair deal is struck for all. If everyone moved to the center, we'd all benefit. It took a long time to get the economy is such a fix – and we can't blame that all on Bush – it's going to take time to fix it. So, let's see what the man can accomplish in these next few years and hope that with Congress taking their heads out of their collective buts and working together (and I mean both parties), we build something great again. I think he should stay on the golf course for the next 3 years. Maybe he can improve there. Not news, CNN. I am hearing from all quarters about the "buyer's remorse." Lots of people I talk to voted for Obama and say they won't do so again. Independents already have cars, jobs and helthcare...Obamessiah will get around to pandering for what they want when the 2012 election starts getting closer. It is mostly old people who disapprove of Obama. These are people over 65. We middle age people are fine with Obama, and in less than 9 years or so we will be the old people and we vote democrat. These so called independents are idiots. What the poll doesn't say is that most of these independents want Obama to go to the left and when he starts doing that his numbers will go back up. A good many independents are left of the left. Not all independents are in the middle. WIth the media lying on his behalf, telling Americans that anything less than 100% support of his socialist policies makes you a nazi racist, and the constant with-holding of all information and facts that are in any way negative about Obama and Democrats, it makes decent people proud of our great nation that Americans are still finding out the truth about the Obama administration. Next up, the constant lying about Republicans not offering ideas for health care reform. Fact is there are quite a few great ideas coming from republican Congressmen and other right voices. Democrats want to have a debate of ideas? Ha, check out what happened to the CEO of Whole foods when he just tried to offer solutions, the Democrat are boycotting him. Democrats have shown it is not about health care, it is about turning our nation socialist. Just another reason why Hillary Clinton should have won instead of Obama. I am sure that Hillary Clinton would have done a better job and gotten more done in the same amount of time. I hope that Hillary Clinton will run in 2012, and we the supporters will make sure this time that she wins! I used to be a Republican and voted for President Obama (would do it again in a heartbeat). I support our president 100%. While I appreciate the president's bipartisan approach, the deplorable backstabbing he has received from this ungrateful xGOP makes me think he should forget these immoral obstructionists and do what's right for the American people by pressing forward with much-needed energy and health-care legislation. President Obama may not get much support from the Party of No (shocking), but he could likely continue to maintain the support of the majority and even have greater potential for more approval going forward. It will be a surprise if he is able to be reelected in 4 years. The only advantage that he has for being reelected is that the Republican does not have anyone half way decent to run against him. I do not believe any Polls that CNN puts out. Lots of people who did not vote for Obama can't have buyer's remorse, because he is elected. I, for one, will fully support his health care reform, if it includes the Public Option. Zoby poll on august 31, Obambi's approval rating is 42%, on Rasmussen dated September1. Obambi's approval rating is 45%. Democraps are the reason Obambi's approval rating is falling especially from 18-29 age group; they're abandoning him, they do not believe him anymore. Here's another kicker for Obambi while he's slip and sliding away, CODE PINK joined TEA PARTY. Four more months and 2009 would be over, 2010 would be a bad year for Democraps.